North Carolina is a beautiful state with so much to offer. As a rather conservative person I think that taxpayer money needs to be not only spent well but frugally. Unfortunately, North Carolina has not valued educators as it should. Some paring of funding may well have been appropriate. With less money most school districts in North Carolina have managed, until changes in testing make long term trends an exercise in comparing apples and, oh, say celery, to not show much, if any, deterioration in skills among their students. With outcomes similar over time it is hard to argue that some aspects of previous spending were not wasteful. Education has always been a carousel and pendulum ride between different strategies, methods and, yes, fads. Enormous amounts of money have been spent on such endeavors. Now, the trend is towards the use of notebooks, laptops, tablets to further instruction. This is expensive and there is inherent obsolescence that requires commitment to further large expenditures of money down the road. While it may exist, and everyone will have an opinion, I have not seen much evidence that these expenditures are justified in outcomes in comparison to other uses for that money, the opportunity cost. (But it is a grant we won! How could we turn it down?! Um, that is not free money. It is borrowed from somewhere, mostly the future and to some extent China) I hope the positive outcomes will be there because that is a money that could be spent in many ways that have proven effective over the years and to pay for quality teachers. I am not a big fan of tenure, as I have seen some teachers ride along for years with little productivity and even less reaction to this. So North Carolina passes a budget with raises for teachers that on the early years of the pay scale yield large raises and nothing, for all practical purposes, for teachers with a great deal of experience. What must be noted is that these are not actually raises at all give even the low levels of inflation for the past 3 or 4 years. For the veteran teachers it represents falling behind for another year by the rate of inflation for the year. Further, in North Carolina, the pay scale is subject to legislative approval most every year. So if you are a new teacher and look at the pay scale and say to yourself, “Self! Look what I will be making in 5 years! Woohoo!” then you could be sadly disappointed as the legislature could do exactly what it has been doing, basically freezing your salary by making what you make at year six the same as for year 5. It is at their discretion each year. So watch out! So why am I going on about this? In my district in North Carolina our local supplement has not been restored to the levels at the beginning of the recession even the county as a 25% budget balance, far above what is considered prudent. Taxes are among the lowest in North Carolina. Have the low taxes led to vast migration of businesses and industry to the county? No. What does not appear to be understood by county leadership is that businesses don’t just look at the tax rate. They look at other factors as well, the educational status and support for education, school ratings on Zillow and other sites on the web, community support for recreation, not just remaking a downtown, and at other indicators of the overall health of a community. 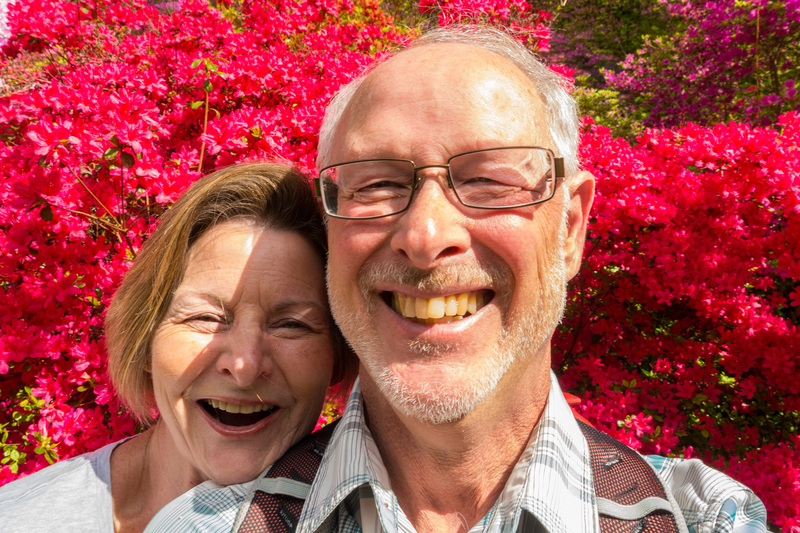 With no prospects for improvement and approaching the end of our working life cycles, we realized that there just would not be enough money to do what we wanted to do in retirement. Nana will be fully retired and I will work to fund all of her extravagances! I expect martinis and lingerie at the door when I get home each day. Yeah, right! Not necessary at all. Instead of constant monetary anxiety I will come home to a less stressed spouse, and that is enough right there. There are downsides. Expenses of moving but they will be recouped. Moving further from two grandchildren but a little closer to three. I know!! It is supposed to be wet out there! Raincoats or hats! And I do already know, no umbrellas or you will be silently ridiculed! It will be about a 30-35 minute drive to my district. Some of the time through residential or I can four lane it most of the way but my favorite route so far is through a beautiful river valley with field that spill over with fruits and vegetables. The cascades rise to the east as I approach from Everett. Every day (yes, there will be many days where clouds and drizzle will spoil the view!) has the potential for me and us to see and do the things we yearn for when we travel. What better conditions for work. Someday we, at this time at least, anticipate returning to North Carolina to retire, perhaps around Brevard unless it is completely overrun by sweated out Floridians seeking something cooler to the north. Who knows. I hope, even among my usually favored conservatives currently running the state, that they find the will to do what is right on a consistent basis for education. The children and the teachers deserve better. The state deserves better. Give us a reason to return. Um…yes it has been a long hiatus, but…we’re back!! We had not looked at the sight for quite some time. When we did I saw that people from dozens of countries had visited. While we realize there is not a huge demanding audience worldwide waiting with bated breath for a new installment, we decided that going forward was fun! The next few years could be quite interesting as well and this will be a way of documenting the changes in our lives during that time. So onward! This weekend we made a return trip to the Biltmore Estate in Asheville, North Carolina. It is sad to think, but so many people we know who were born and grew up in North Carolina have never been there. We bought season passes this year as we wanted to see the estate in every season. 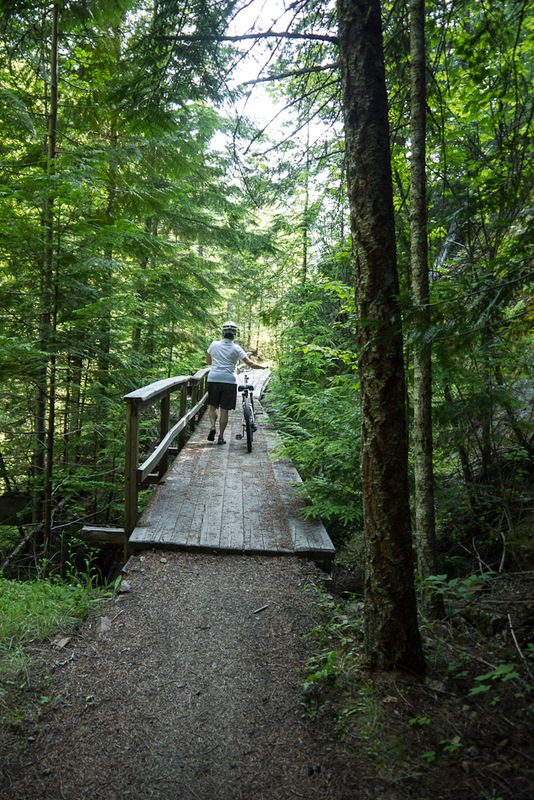 Plus, we can bike the many miles of bicycle trails and paths on the property. For those that are unfamiliar, the estate was conceived and built by George Vanderbilt with construction starting in 1889 and opening for visitor in 1895. 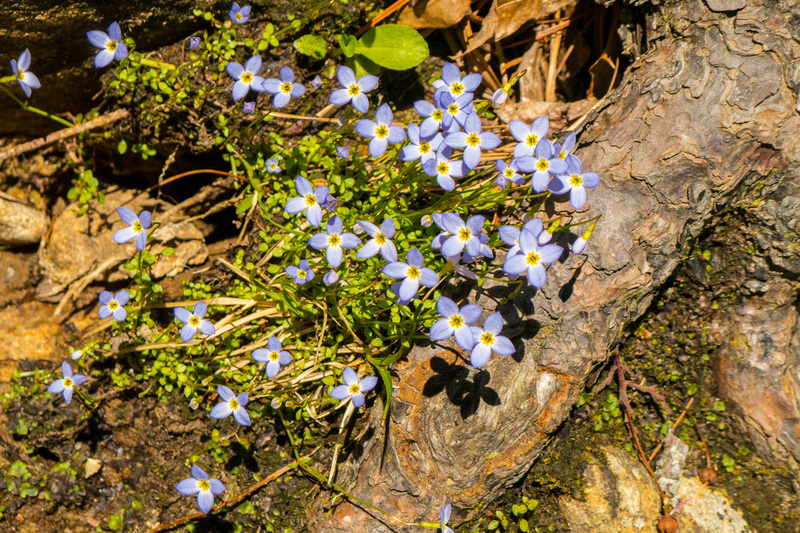 While it is difficult to conceive today, the original estate included over 125,000 acres most of which became part of the first national forest in the United States. The house was the largest personal residence ever built in the country. Richard Morris Hunt was the building architect and Frederick Law Olmsted, famous for Central Park in New York, was the landscape architect. The home is still in the Vanderbilt family overcoming, wars, depressions and taxes! So off we went this last Saturday. 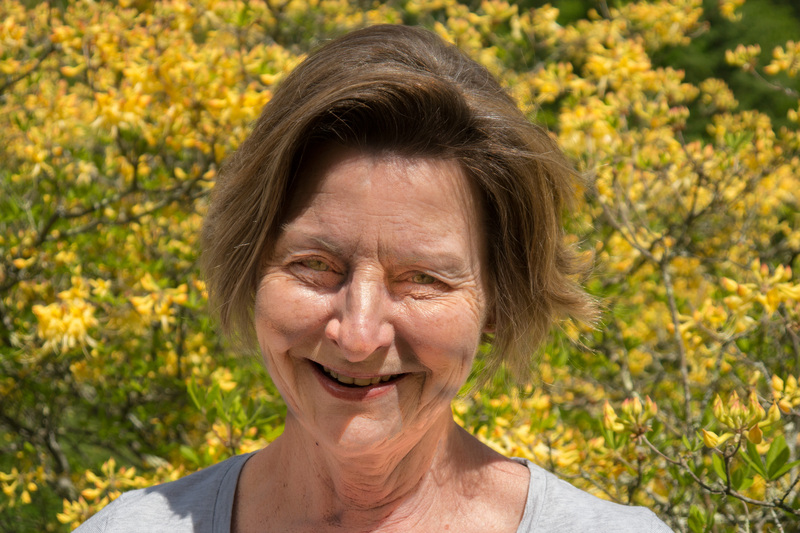 This trip would be to visit the gardens, not the house itself, and make an obligatory, yet welcome trip to the winery. This would only consume about half the day so before hand we journeyed south of Asheville to what could well be our future retirement destination in the area around Brevard, North Carolina. 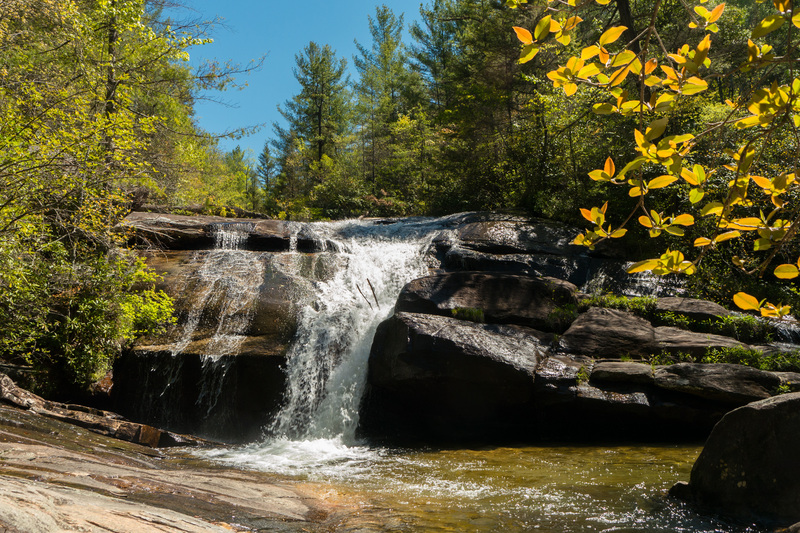 We want to have a short hike on an absolutely gorgeous day at Dupont State Recreational Forest, over 10,000 acres that was last owned by the Dupont Corporation to conserve clean water for its manufacturing plant. 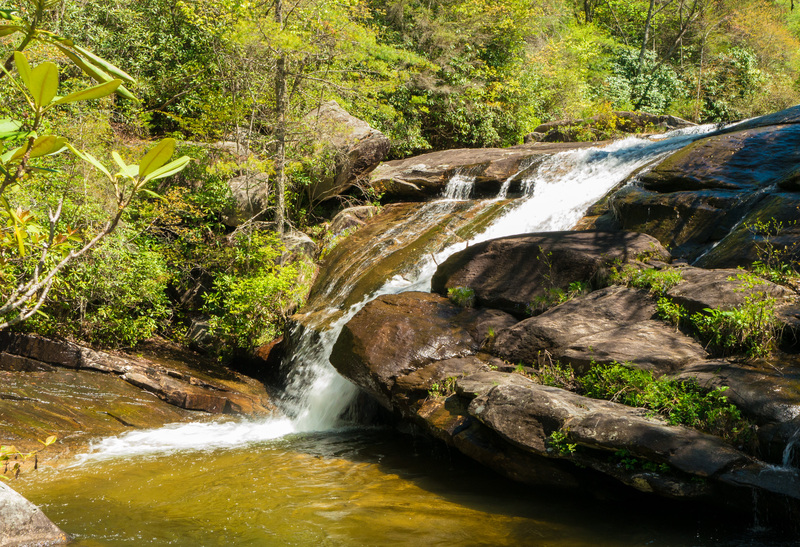 We have previously visited the larger more frequented falls, such as Triple Falls, and wished to get a little bit more off the beaten path. 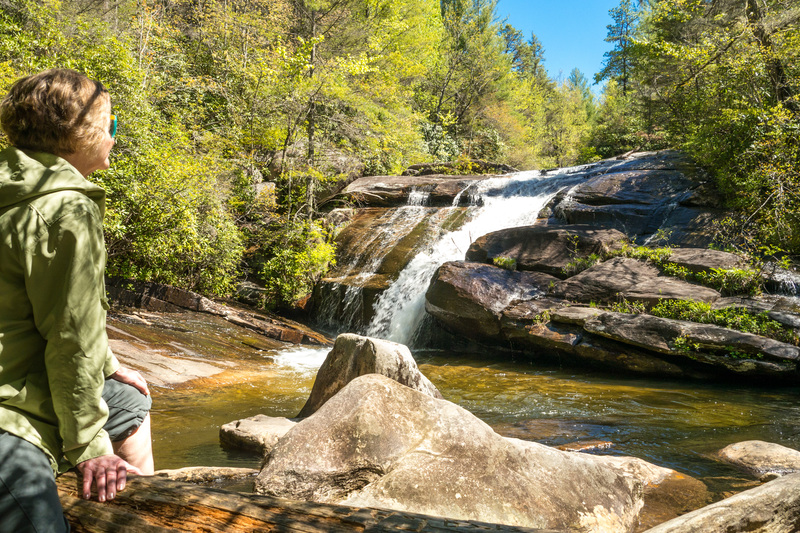 So we entered from the old CCC road on the north side of the forest and hiked to Wintergreen Falls. Wintergreen falls admired by Nana! 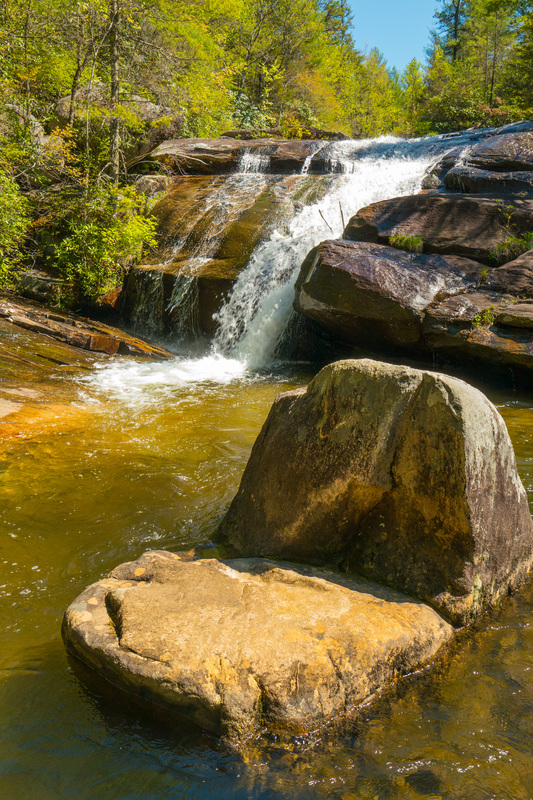 This falls is small but in a beautiful setting. The entire time we were there no one else appeared. 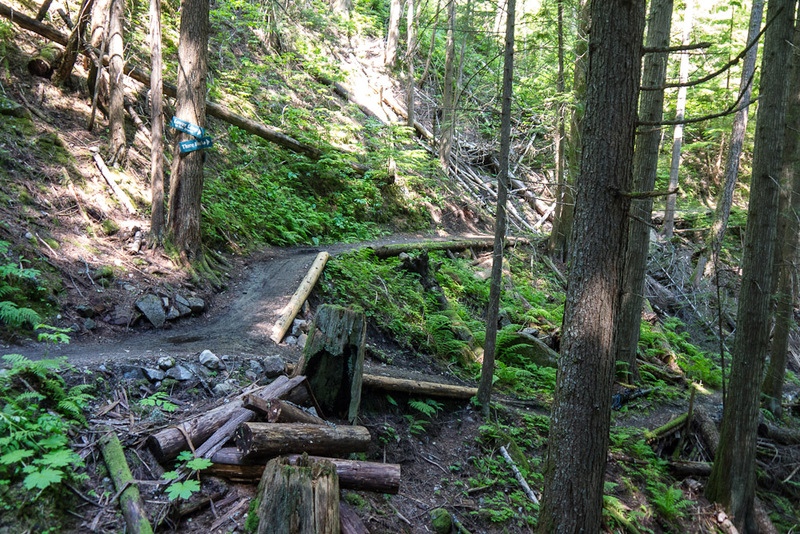 There were others on the trails which are also used by those riding horses and also mountain bikers. Both leave the walker with something to be vigilant about when hiking. Along the way we were passed by equestrians which included one finely attired Julie, quite the lady in her “hat” on top of her head which enclosed her ear. I am sure it has a name. Also, we rescued a man and his two young boys out for a day of mountain biking but who had no map so were pretty much lost on the 80 miles of roads and trails. Fortunately I had as spare may and I hope they are not still wandering the woods starving and avoiding the occasional black bear. So here are some pictures of the falls taken a while before noon. Perfect temperatures, skies, day. After a nice lunch at the Square Root in Brevard, we drove on to the Biltmore Estate. We did so with some trepidation as I had realized that, while trying to avoid a wallet like George Constanza’s on Seinfeld, I had earlier removed our Biltmore passes and wondered if our afternoon would be a lost cause. Not to be! The kind gentleman issued new passes, whispering that they usually charged for new ones but he was going to let it go this time… So, shhhhhhhhh! We made our way to the garden parking area. We had been there a few weeks ago when the walled garden was filled with tulips and other bulbed and unbulbed flowers. It was in a transition state and a touch dowdy at this time but this was expected. Our goals was the Azalea Garden and the walk to Bass Pond. Here are a few pictures with an included ridiculous selfie just so we fit in with the zeitgeist! Note that on the two pictures of the conifer the pollen exploding when even gently touched. 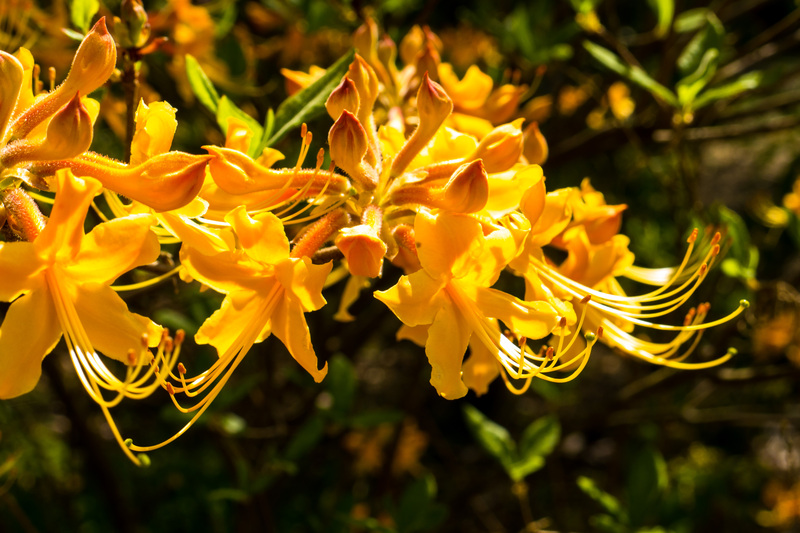 Rather beautiful yet probably contributing to “yellow lung disease”. I don’t think any attorneys have addressed this peril yet. Many of us our ready to sue or be sued due to the buckets of pollen we or our neighbors dump maliciously and capriciously and generally eviliciousilly (made up word!) into the atmosphere this time of year. Our poor lungs! And not to mention that we all bought cars of a particular color for a reason and right now they are all YELLOW! 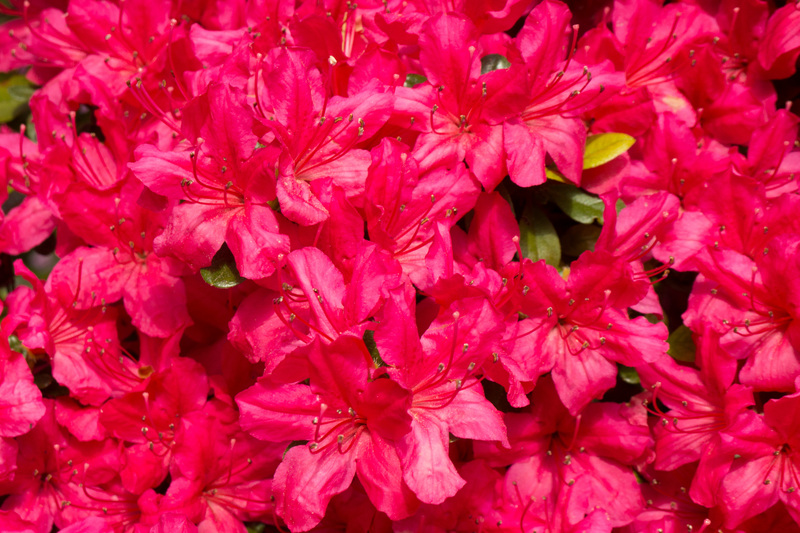 Yes, where are the lawyers, the peony and azalea chasers, when you need them! I’ll tell you where! The Barbados! 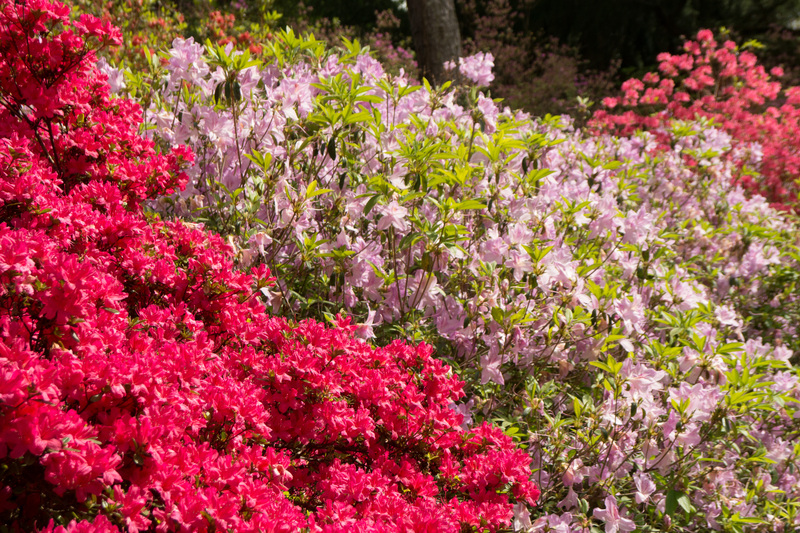 Massed azaleas at Biltmore Estate Gardens. 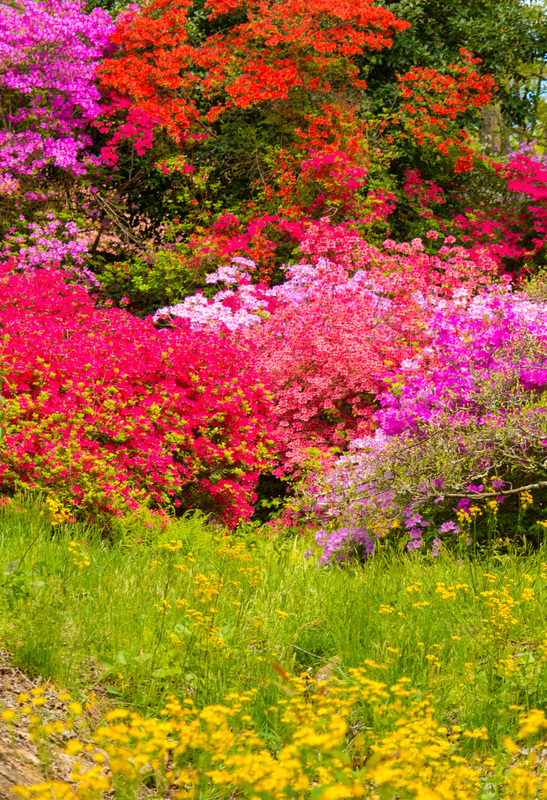 Massed azaleas and wildflowers at Biltmore Estate Gardens. Ok, I don’t know what this is! Help! Anyone! Obligatory selfie. God, I didn’t know that tooth looked that crooked! Nana. 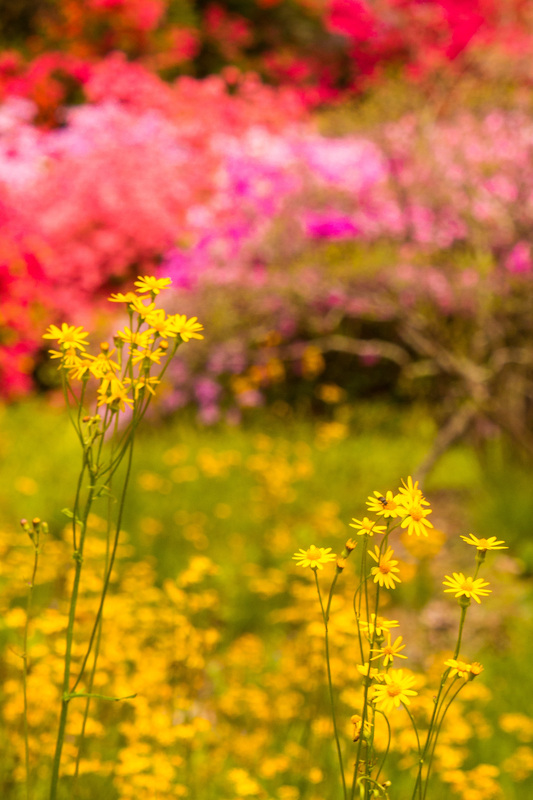 Happy in flower paradise! 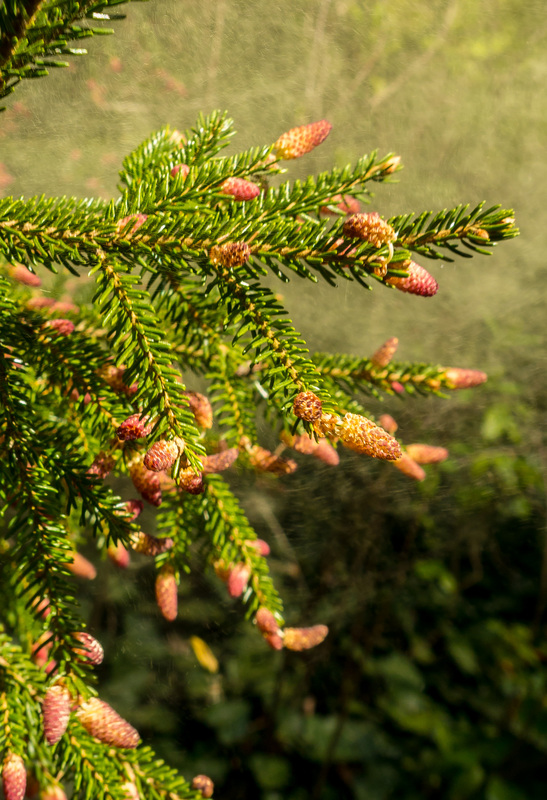 Conifer shaking out a lung-full of pollen! So, pollinated and visually saturated, off we go to the winery at the Biltmore. Now, in 1990, about the last time we had any of their wines, they had only been in business 5 years. They are much improved since that time. That it took so long to actually drink their wines again says something about our opinion at that time. Not that we are wine experts. Nay, Nay! They ARE much better now as far as we are concerned. We really like some of the Chardonnay’s and the Reserve Tempranillo. Nice place for some wine and cheese, but we had to be careful, had a drive home in front of us. Pretty good day. This is how spring should be! I love zoos and aquariums, the big one and the little ones too. I remember how much I enjoyed going to the city of my birth, Oklahoma City, and visiting the zoo there. Over time, at least from the last time I was there, quite a while ago, the zoo always tried to maintain an open environment for the animals and give them what they needed. Way back “in the day” some of the enclosures were rather small for some of the larger animals but that improved. The zoo gave me a great appreciation for animals, the diversity, the immensity of some, the concept that there are predators and prey and that this extends to humans. We are animals and eating other animals is what we do. Religious aspects aside, and personal choice aside, to demand that others not eat meat is, well, like asking an elephant not to mate, a crocodile not to swim or wasps not to sting. To be sure, have respect for the sacrifice, from taking the life. Even vegetarians are killing something. That grain is alive inside, ready to create a new oat seedling when the moisture, soil and temperature are right. Doesn’t it have a “right” to be what it can be? How dare we snuff out its potential to make oatmeal! Well, I did digress. I apologize. When we were in Vancouver we visited the excellent aquarium there. I still prefer Monterrey’s , Atlanta’s, and even Chattanooga’s along with Baltimore and even New Orleans. But is had some very good exhibits. 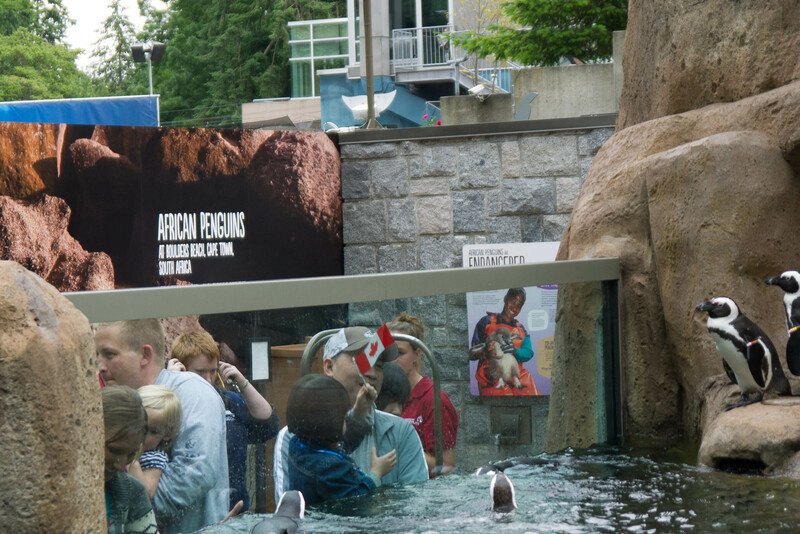 They were promoting their new exhibit with African penguins. As to be expected they were really cute. 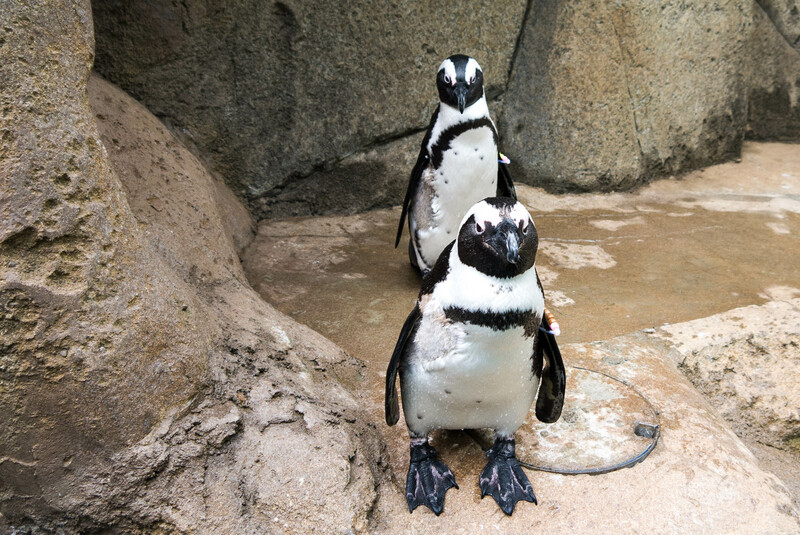 As cute as they are, they are still in an aquarium. They are still in captivity. Daryn and Little Nora move out of the way on the left for the hoards lining up to see the little guys who seemed just as interested in the people. But what travel allows is the opportunity to encounter animals. That word encounter, to me at least, implies either a serendipitous experience or an active search with an uncertain outcome. Granted, there are some animals that many or most would not want to encounter except under very controlled circumstances if at all. Vipers, sharks, Kodiak bears, Black Widow spiders, and Ted Nugent, as examples! Some people go pretty far in this, such as the guy in Utah that has dressed himself up as a Mountain Goat and trying to keep up with said animals in the mountains in that gorgeous state. I just hope he isn’t still romping on the trails come mating season or has left this off before Mr. Nugent decides to show up there for hunting season. Not sure which would be worse for the goat guy. I don’t know if he is dressed as a male or female goat but both present potential issues that could be quite threatening or uncomfortable. Digression! Mea culpa! The kids, from the Papa and Nana perspective, had the good fortune of going out in a Zodiac to whale watch and ended up about 100 yards off where we were staying on Pender Island, as was reported in an earlier post. This would be an active search. Far better than the zoo, as you get to see the animals in their habitat, in this case, as pod units. A day or so after their journey back to where they woke up that morning, we were down at Gowland Point, exploring the beach.The whole gang was there. We worked around towards Brooks Point watching the geese, duck, sailboats and freighters that were in the strait. Someone, I don’t know who, was creating a bit of noise out on this peaceful end of South Pender. Others were gathering along the shore. And so there they were, sometimes 20 or 30 yards off shore, casually working their way along their course around the southwest edge of the Penders. 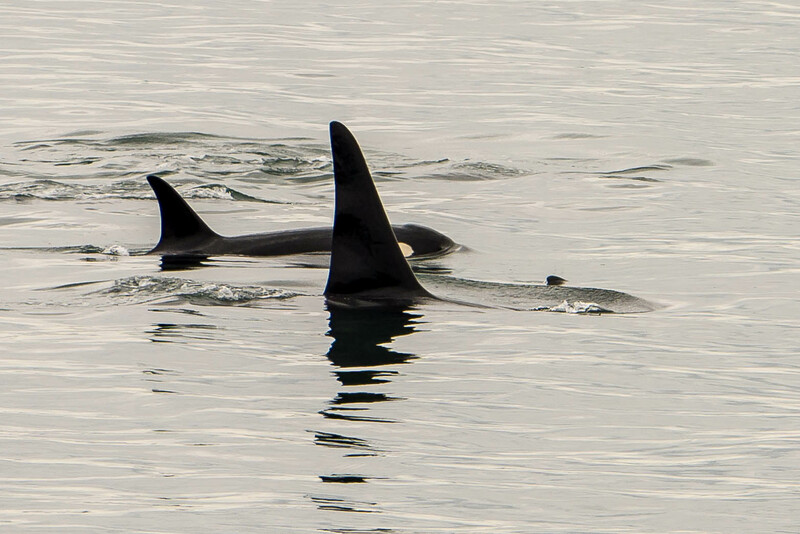 It was only a small group, a family perhaps, but did not appear to be an entire pod. This was exciting. The serendipitous encounter. 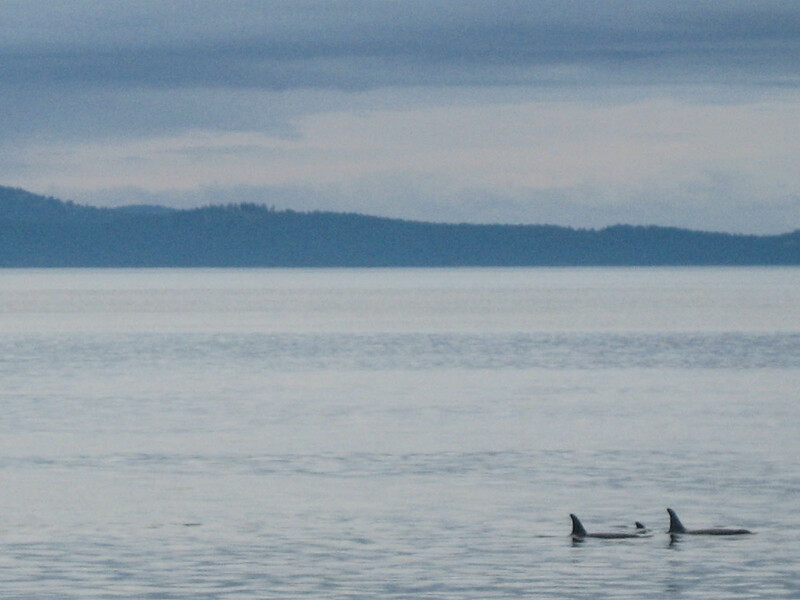 People, including ourselves, ran along the shore, climbing over rock and trying to stay even with the Orcas who pressed slowly ahead through the midst of boats that were already there. And not a Zodiac in sight, just the serendipity crew to observe at that time. 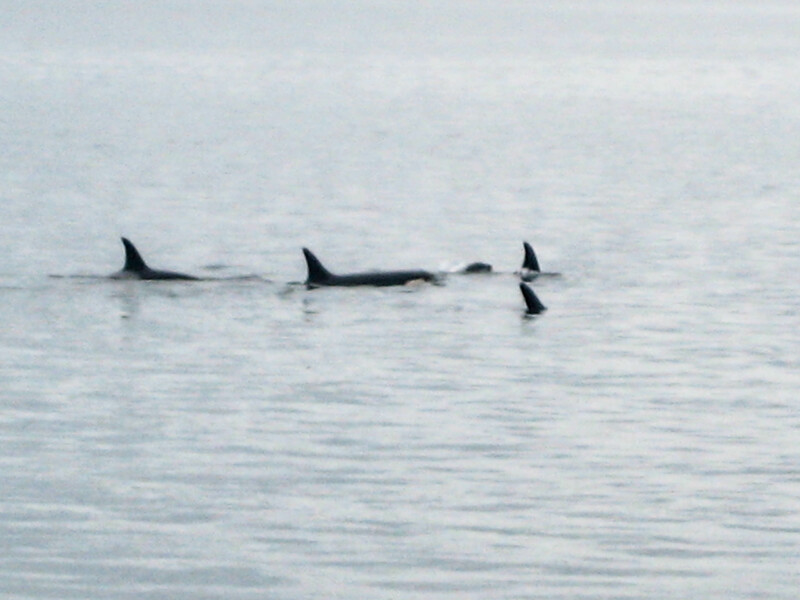 A small group with at least one youthful Orca. Only yards from shore. Or meters! But this was not the only encounter. Nana, one morning, decided to be the early bird. Well the early bird didn’t get the worm but got the bird. 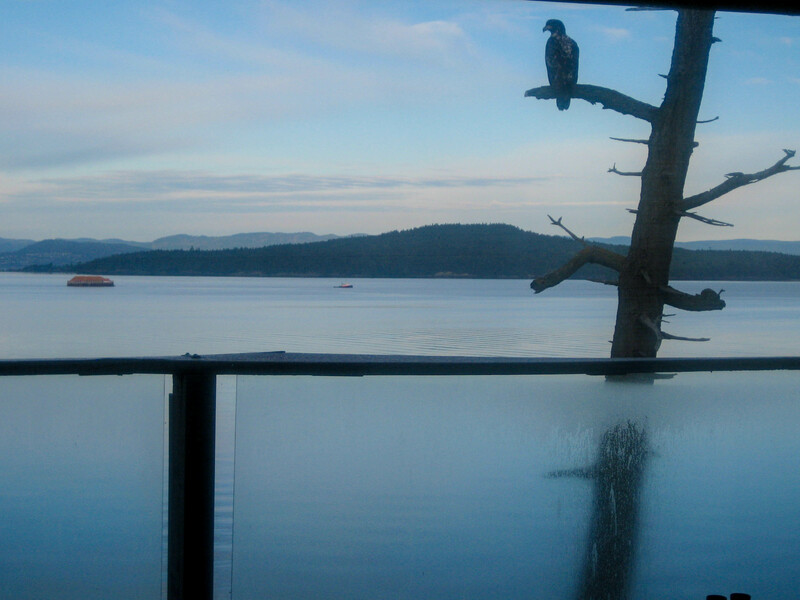 An eagle sat just outside our house, looking down over the kelp beds below, scouting for breakfast. Lightening quick, Nana snapped a couple of pictures before it moved on. Eagle just off the deck of our rental house on North Pender Island. Looking for food or enjoying the sunrise? Way to go Nana! 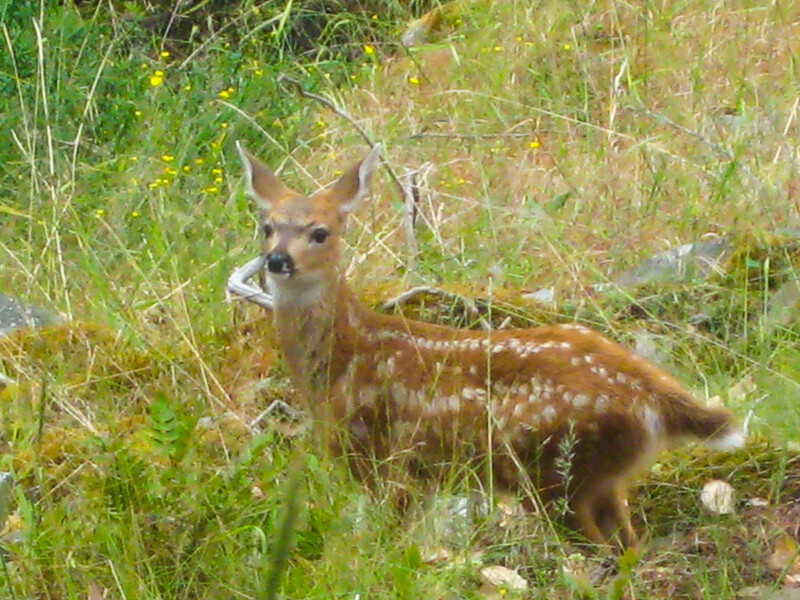 Here’s one to fawn over. While traveling by car we ran into, not literally, other species. These guys are apparently considering whether or not to risk the falling rock! 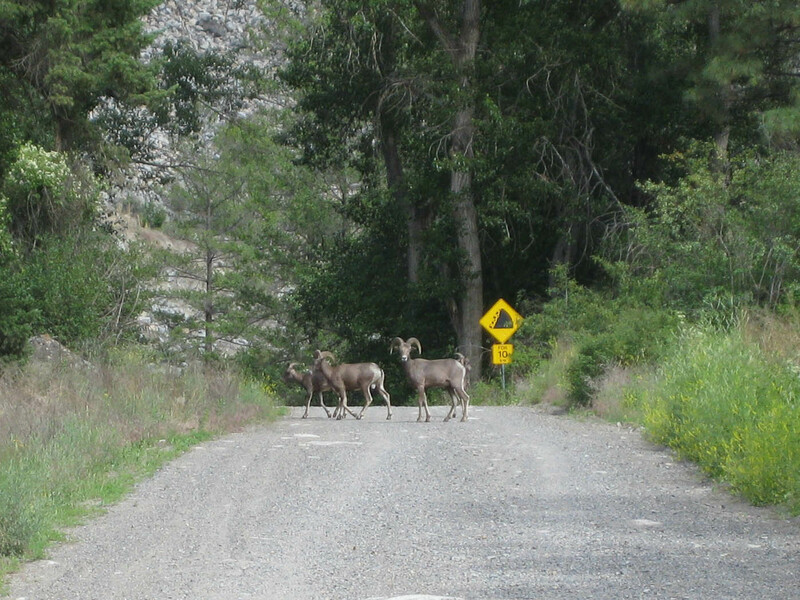 Bighorn sheep considering their next move. Sometimes you can just be too slow to the camera. 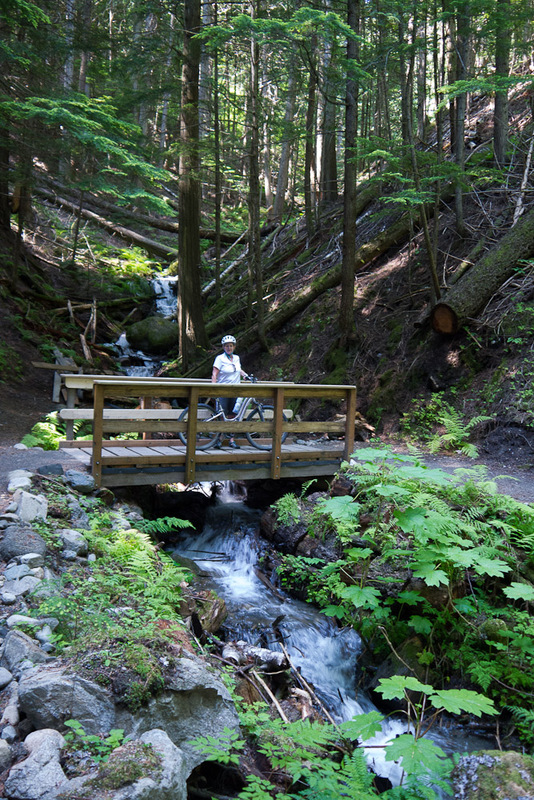 As a Where’s Waldo experiment, see if you can spot one of the two bears encountered along our path? Got to move fast to the camera…where’s the bear?? Find him? He actually is barely, or bearly in the picture but looks like a shadow. So this one is just for the memory book of the brain. As to the appropriate travimal experience, my vote is for encounters! But I will still enjoy the searches and the zoos and aquariums, as well. Considering the areas we drove through on the mainland, it is remarkable, but we did not bag that moose we were looking for. I bet it was there, though, just didn’t have eyes sharp enough to see him. Next time! A tree that is not native to just the northwest coastal areas, but is also found in Mediterranean climates and other areas is the Arbutus tree. 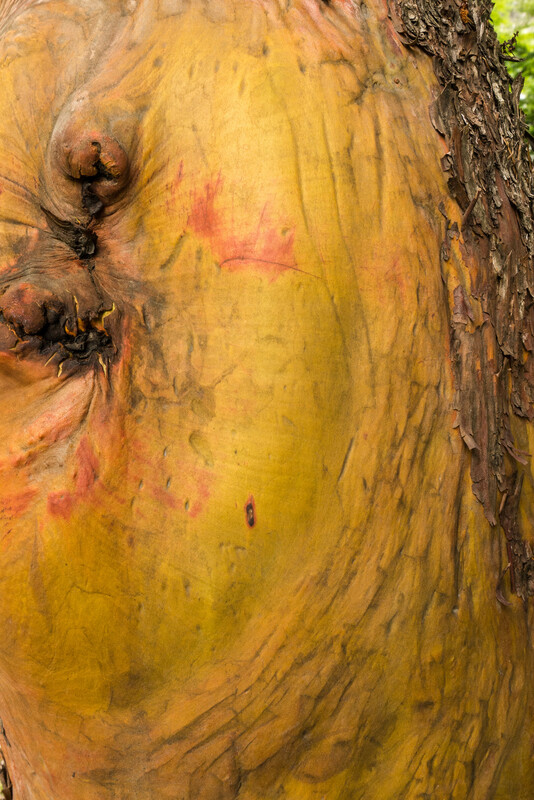 In areas outside this area in Canada it is known by other names but usually as a Madrone. 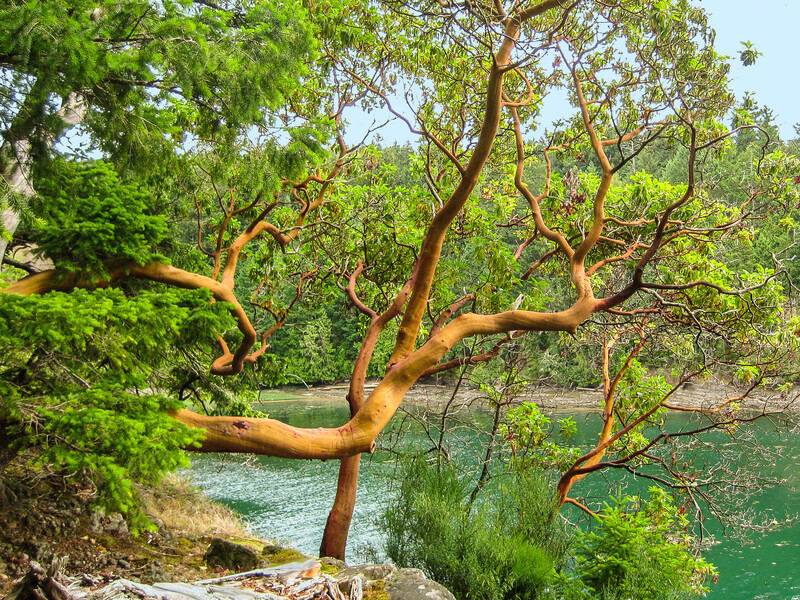 Nana fell in love with the Arbutus and took this picture on Pender Island on a tiny peninsula from which you can look out at the strait separating North Pender from other islands such as Salt Spring. 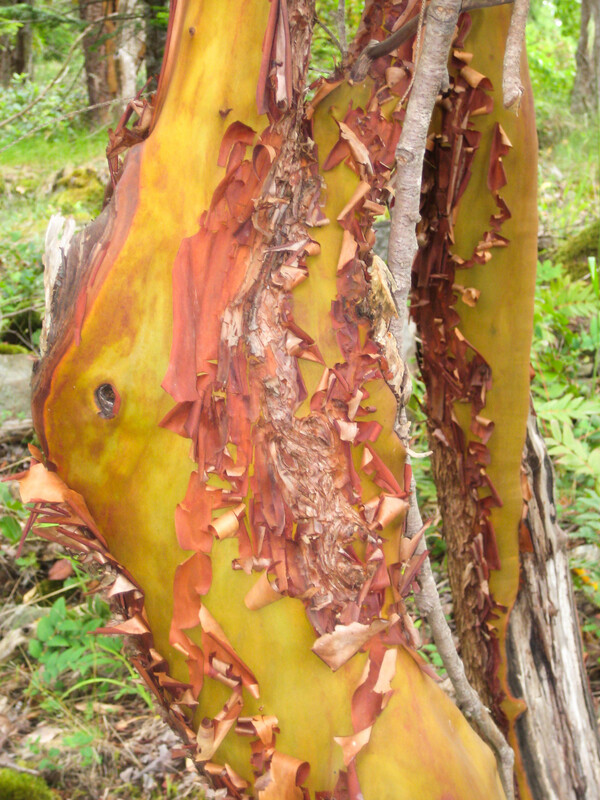 The Arbutus or Madrone tree. Nana’s pictures! The Saanich First Nation peoples had great respect for the tree and would not burn it for firewood as it had saved them during a great flood, yeah, that BIG one that everyone seems to have had, as it gave them something to grab onto on a high spot of land. 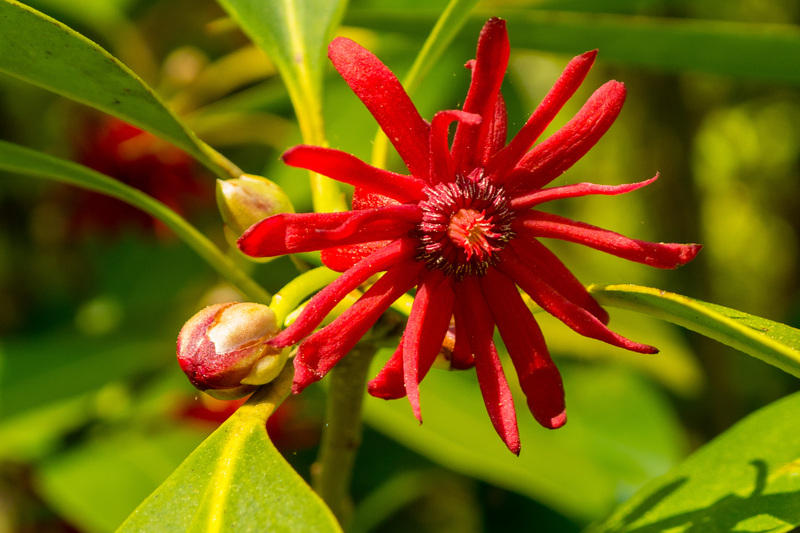 It was used for medicinal purposes and somehow or another used for contraception. Anyway, it is a beautiful tree. 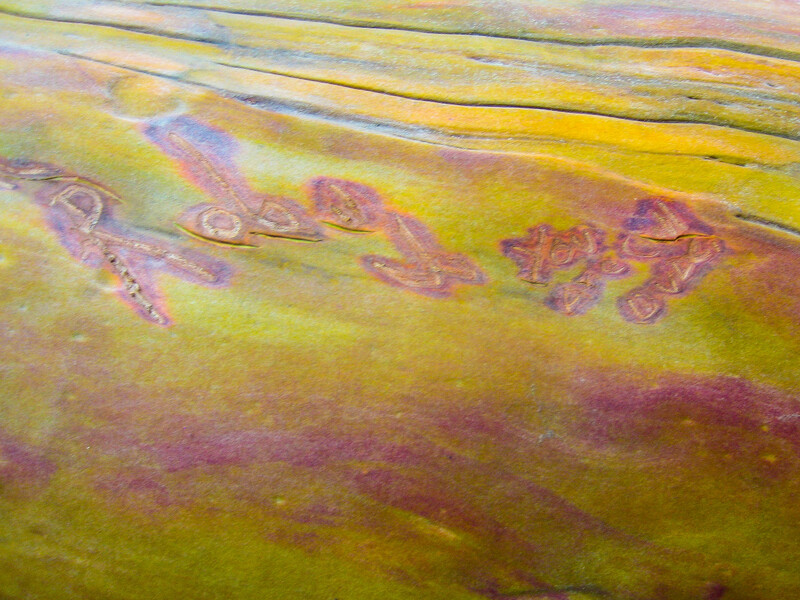 Unfortunately, it peeled exposed bark area just invites engravers, such as in the second picture. I promise, “Rob” is not me! I have trouble reading this after “Rob”. Help anyone?! Here are a few other images I think Nana took. I won’t do a Rorshach on this one! This next one does the best job of showing how the bark peals. 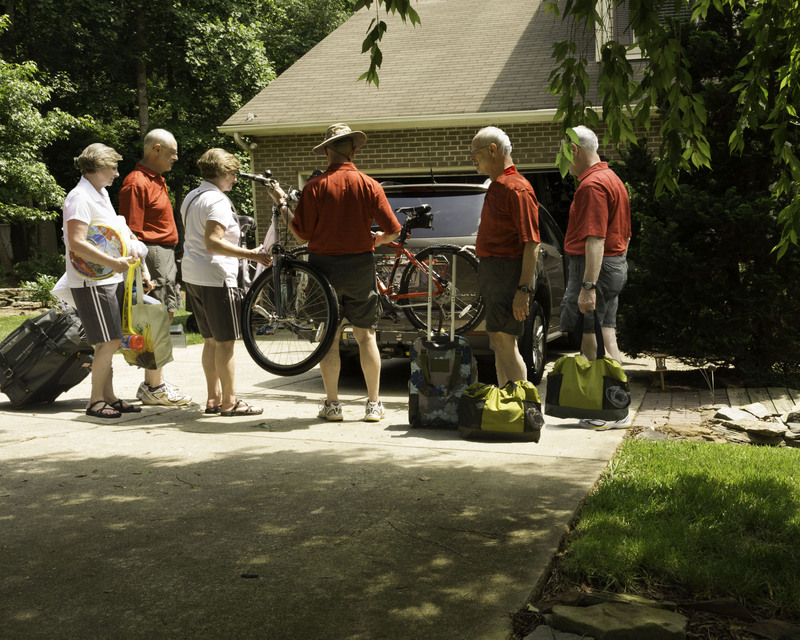 Getting ready for a big vacation can require a lot of help from friends or relatives! Packing the car was easy with all of this help! Pictures capture a moment in time. Pictures can be altered and given how fickle memory is over time, the memory can come to match the altered picture. Our brains do that anyway which is why witnesses to crimes are notoriously inaccurate in their descriptions. So while the memories are fresh I will begin a series of pictures, while those memories are popping fresh, that will communicate some of the experiences that go with them. But first, we are home. Post trip blues are clearly evident. There has been no wrist slashing but that sounds pretty good. Now, to pay for the trip. Now, to get rid of the pounds gained on the trip. Now, to do something with the 1700 pictures amassed on the journey. Yeah, that many. Most will be disposed of. Will memories be disposed of in the process? Will anyone care in twenty years? We tend to keep “good” pictures, but are they the ones that tell the best tales? This is an OK picture. pretty decent composition, I guess. Wish I had hid where the stones lead better. Lighting isn’t great. Good detail, see the coins dropped in the water, like that adds to the garden! What do people think? Someone has to go in there regularly and drag this out of the algae. The picture is at Butchart Garden. It is beautiful, though expensive as I noted in an earlier post. Sneak food in though, they clean up on that. Anyway, this picture has a little extra meaning for me. As I was composing the picture and waiting for there to be no one in the shot, something of a challenge to do with the 20,000,000 people roaming the garden, several people came up from behind me. Both with issues. Please note, the stones are about four inches apart in the water. Crossing this is not a task from the Amazing Race, or Wipeout. 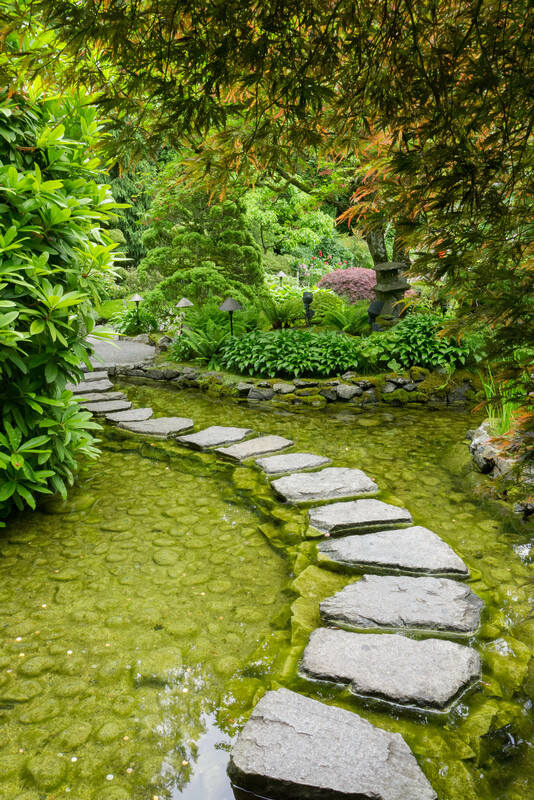 The stones are relatively flat but not perfectly so, which is part of the intent in gardens of this type in Japan or China. The water is about 7 – 8 inches deep. I don’t think many adults would be drowning in this. So unless you are doing handstands and grabbing coins while crossing you are going to be pretty safe, I think. The purpose of a blog like ours should not be to make fun of anyone and in this case that is not the intent either…it is tempting though. The first group to arrive behind me was a couple, mid-forties (like I can tell how old someone is, not! ), and at least looked normal enough. The female spousal figure, I’m pretty sure it was a spouse, reached the spot next to where I was crouched. There was room to pass. She would not. “I just don’t think I can do this.” Yes, this series of mostly flat rocks right next to each other was beyond her capabilities. Last year I hurt my back pretty bad. I had signed up for a mud run by one of the now ubiquitous groups making money “letting” people for a fee run something like a 5K but with the added element of including 9 or more obstacles in the path of the runner. These involve climbing, sloshing or crawling through mud and other activities designed to make you feel either a) inadequate; b) awesome; or c) stupid, because you actually paid to humiliate yourself and ruin a set of running shoes, that is if you can find them after they have been sucked down to hell while trudging through thirty feet of stinking mud. Well, I will let you decide which group I fall into but I think I know. But, due to my injury I was forced to miss the event, not get the “free” beer I had paid for in the entry fees but did avoid collapsing on top of a tall wall, looking like a coyote, shot to death and thrown over a fence like you see out in Montana. But with less hair. So even with encouragement from the spouse, whose eyes said he wanted to go this way, they both turned around and headed for the safety of an alternate route, one relieved, the other disappointed and probably feeling like he didn’t get his money’s worth that day. Still waiting for the tidal wave of people to depart the other side, another couple arrived. Probably in their mid-thirties. Healthy looking enough. No one overweight, no canes or walkers, wheelchairs, both legs firmly attached. This time it was the woman that wanted to proceed. He balked. “They’re too far apart”, he proclaimed. “I don’t think I can.” At first I wondered what he was talking about. But, of course, it was the stones. The gaps, in his mind were enormous. I understand being a coward sometimes. I have never been good with heights. No roller coasters for me. A couple of years ago I decided to try and overcome this. 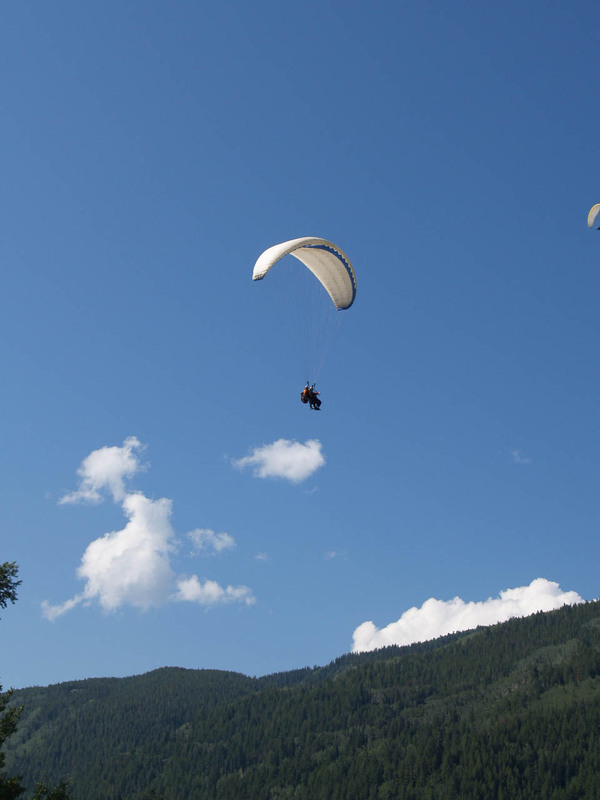 So while in Aspen I paraglided off a mountain. 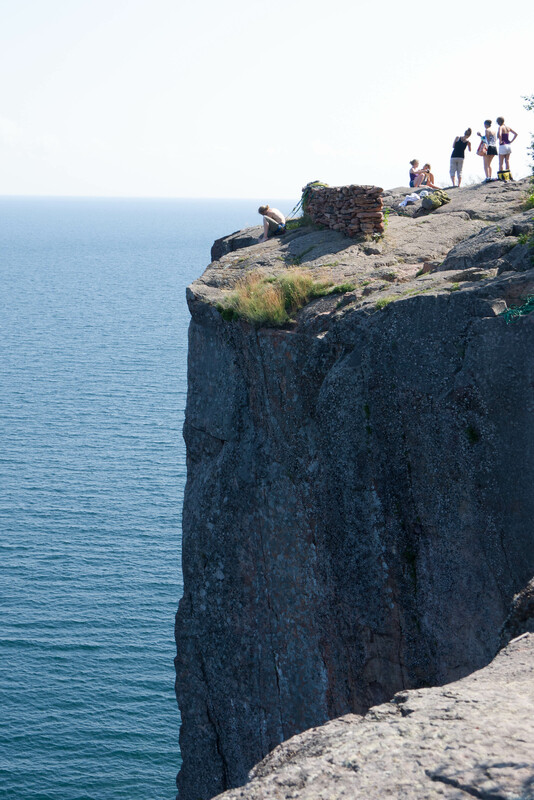 The fear that comes just as you run off the edge was difficult to overcome. But as with most such things it settles into another emotion, sometimes sublime or joyful. Nearing landing a few years ago in Aspen. Overcoming my fears. But I still have my limits. While driving along Lake Superior on this va-ca we came across climbers working up the cliffs above the lake. Well over a hundred feet of straight up or angled outward precipice. I could not bring myself to crawl to the edge and look over at the climbers below. But these guys just sat at the edge and helped guide up those below. 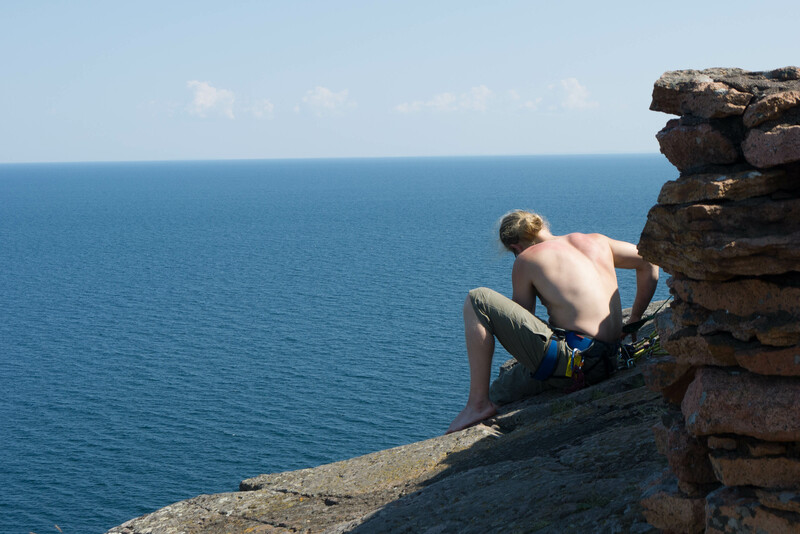 Climber assisting climber along Lake Superior. I didn’t even know it had cliffs like this. Keeping an eye on the edge. I couldn’t do this, well, maybe, for that million on the Amazing Race. Maybe. So I will not judge too harshly, but I can’t help but wonder how a person gets to a place where crossing the small gaps in life is too difficult. At least try. I hope I remember my own lesson. They say a picture is worth a thousand words. It appears I have reached that here. I don’t think anyone wants a picture of mine to be worth two thousand! Done. We have now left our furry friends to the north and have driven along the north shore of Lake Superior, a very apt name. I will talk about that in another post but things have moved faster than my ability to post lately so I will have to work backwards sometimes. Like this time. A couple of months ago, Nana mentioned that she wish she could bike ride sometimes. I had been waiting 25 or 26 years to hear that but could never on my own justify spending the money. What a waist of time. Yes, I know I said waist. I’m not stupid and meant exactly that. We could have been burning pounds around the middle all of that time. And by the way, it was also a waste of time. So within two weeks we had two spiffy more-than-I-meant-to-spend-on Treks. 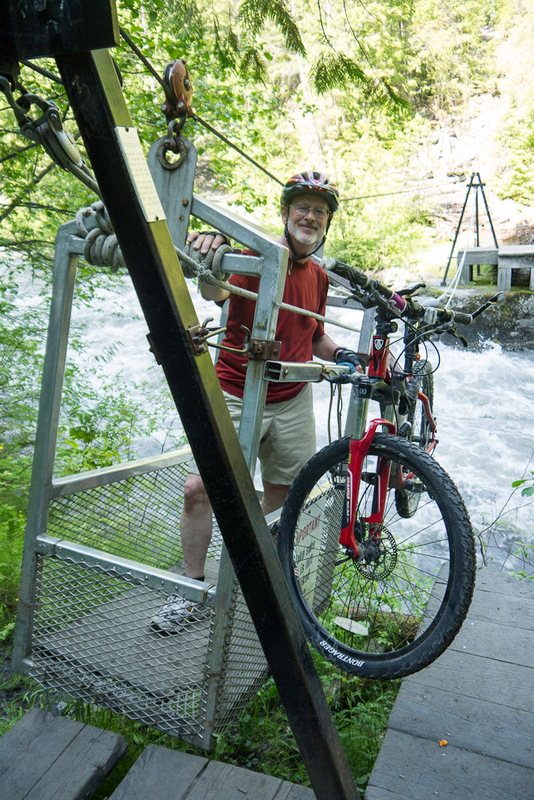 So before our journey we had made a number of outings and built up our feeble miles a bit and learning to control our balance on mostly paved or very smooth greenways and such. As I have previously mentioned, for both of you following this thing, we brought the bikes on the trip and have had several really good rides. But as so often is the case, I may have over reached on our last ride. Just a bit. No injuries but frayed nerves. 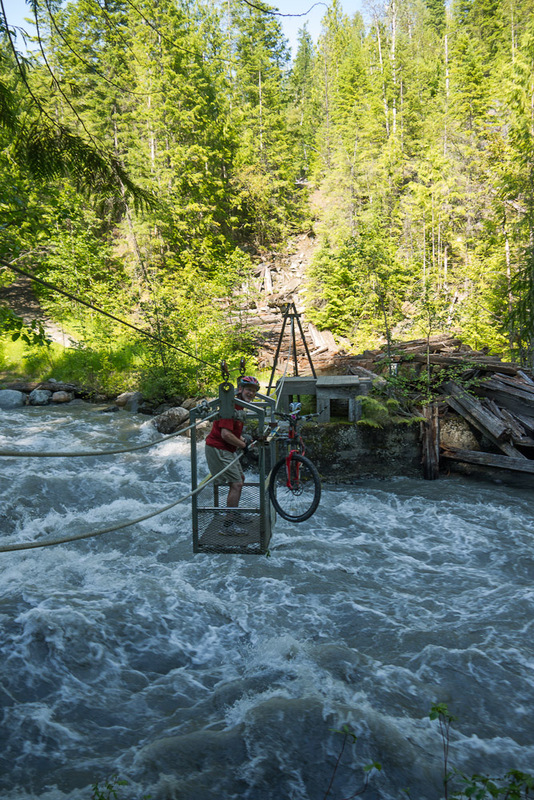 We had left the Okanagan region for Kaslo in British Columbia. We had seen many creatures such as rabbits and squirrels. Oh, I know that doesn’t seem like much but deer were far less rare. We’ve seen a couple of bears on the trip as well. These weren’ t the Jellystone type that are mostly tame and come to your car hoping for Hostess Cupcakes, which I would never give up even if the bear had its teeth wrapped around my skull. I might share some if he asked nice. But not the filling. We never did, to our disappointment, see a moose, Nana’s favorite, I think. 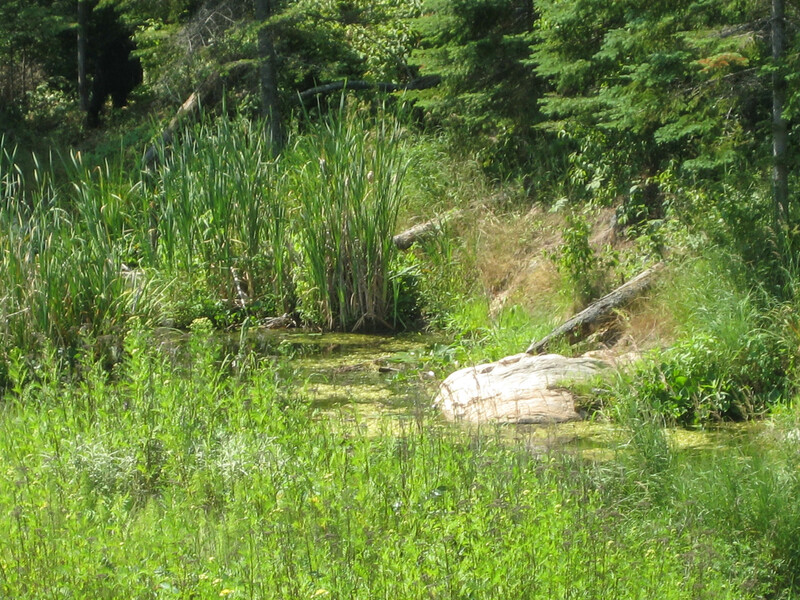 We did see beaver, eagles and lots of other creatures. 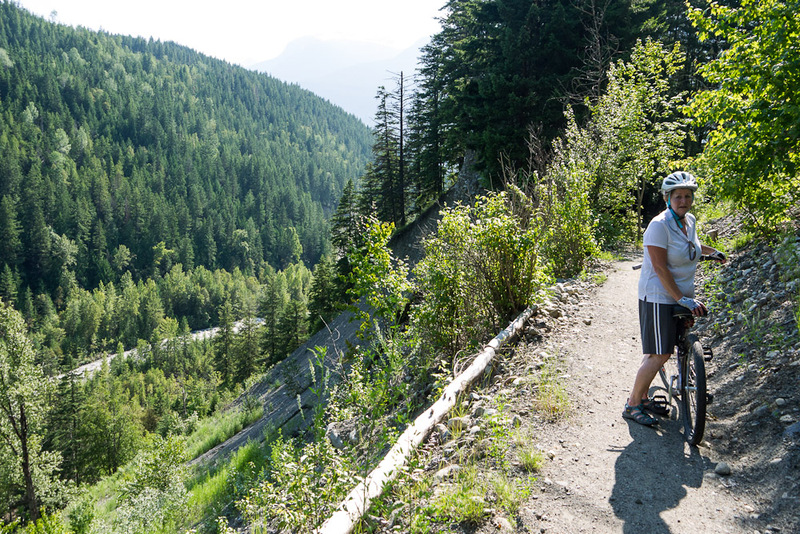 Had we come upon a grizzly, which frequented the areas around Kaslo, I reassured Nana that after I out ran her I would be sure to get help back as soon as possible. She said that wouldn’t be a problem after she threw some ground meat on me, maybe a little bacon, and just sat there until the bear moved on. Neither thought these were very good ideas. As scary as this would have been, nothing was scarier than our ride on the Galena. (insert Kettle Drum rumblings here). 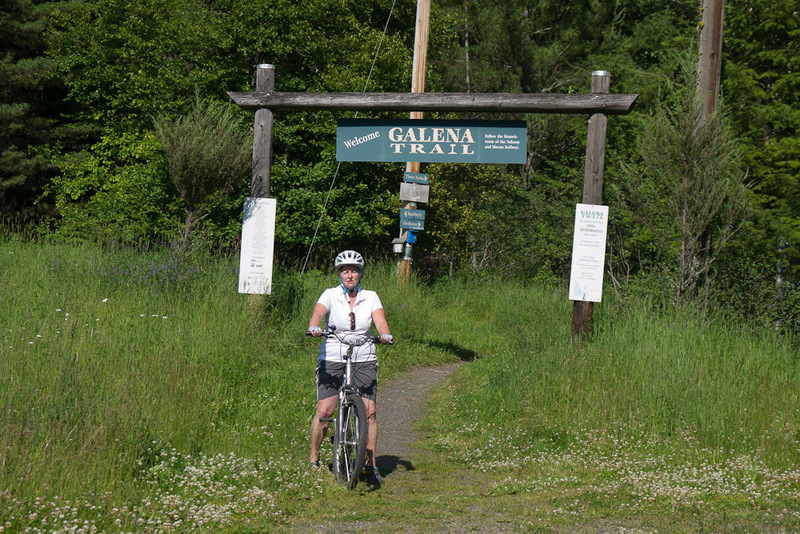 The Galena Trail is a trail just outside of New Denver, British Columbia, along one of the many linear lakes that can be 100 miles long but only a few miles across or less. Absolutely stunning country. Now for younger or more experienced riders this might not have been a big deal but we were Nana’s and Papa’s. I think it was on Monday, Monday, or was I just California Dreaming? Whoops! Wrong Papas! Anyway, this is not a very long trail as some go but it was no greenway. Basically, we were doing single track much of the time. Start of the Galena. Happy in our ignorance. The beginning of the trail is flat but only about 5 inches wide, just have to work on balance, which neither one of us have in spades by any means. So on we go. 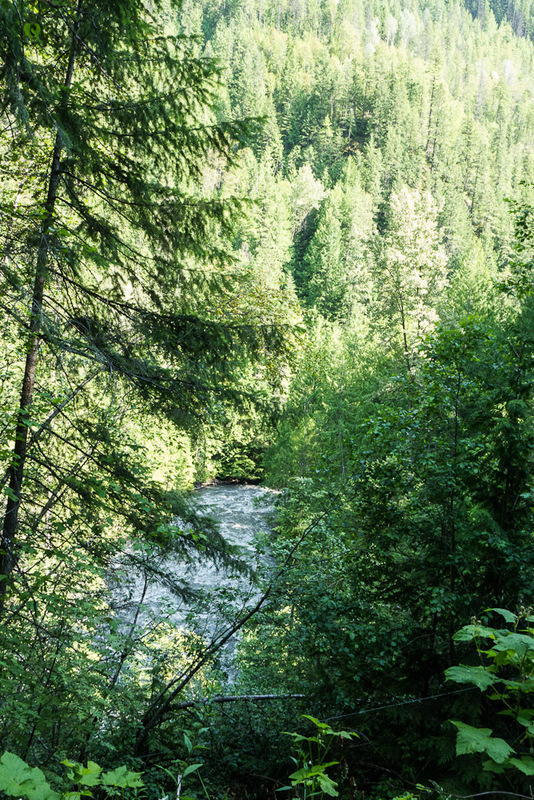 Soon we can hear the roar of the river to our right. Well, not exactly, you also have to look down about 700 feet and to the right. 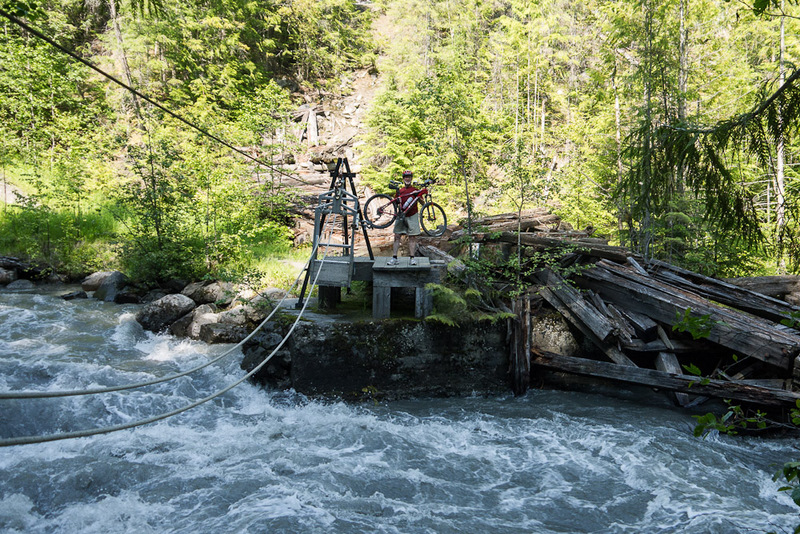 The trail is on the edge of the drop. Again, no big deal if you are confident. I wasn’t too bad but Nana was really confidant. Confidant that she would soon be dead. Nana contemplates the afterlife. Not the narrowest point on the trail with cliffs. Not all of the trail was this way. Some was worse. There were some very narrow up and down hills with curves and no run-outs if your brakes were wet and it was slow to stop. 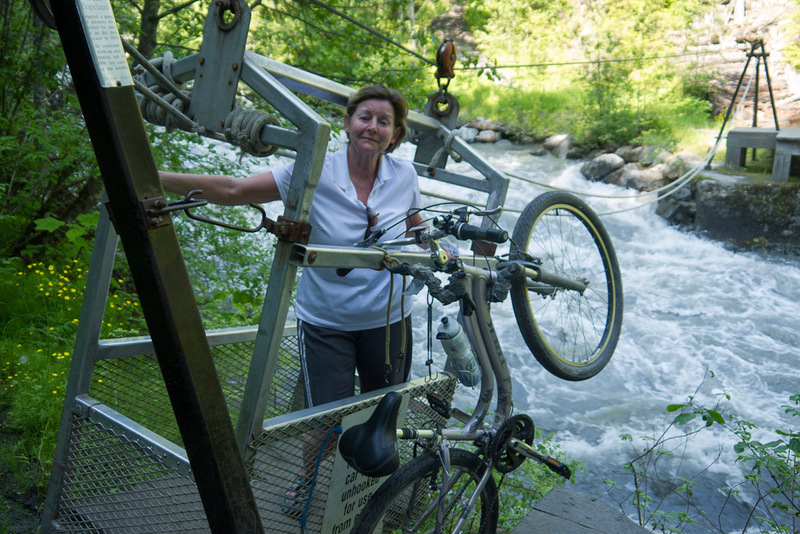 This whole region had been flooded so there was much aqua on the trail. This equals wet brakes. So there were times it was prudent to walk it. Sections of trail not Nana and Papa proofed. With long drops, sometimes better to walk if not confident as newbies. Not all was terror, however. It was a beautiful trail. A fine place to die if there ever was one. Unfortunately, no one might actually ever find our bodies. But there were some fantastic scenes along the way. Waterfall along the way to the moment of terror. 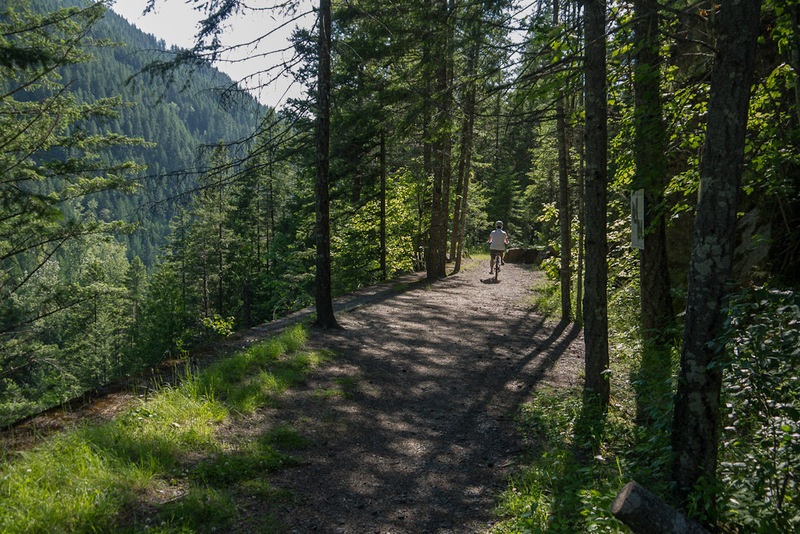 Little did we know that these moments of beauty and joy, coming like a roller coaster, alternating with mild to extreme discomfort and wondering if the insurance was paid up, were mere distractions as were the most peaceful times along the trail. And then we arrived. Finally, we approached the river itself, having risen up through countless cataracts and waterfalls to our level. But were was the trail? No, not to the left. Only forest and briars. Not to the right! Rocks and more trees screened the view to the river crushing around the bend, swollen and roiling like water boiling on the stove. And what was this contraption ahead? Well, it was the way across. The only way. 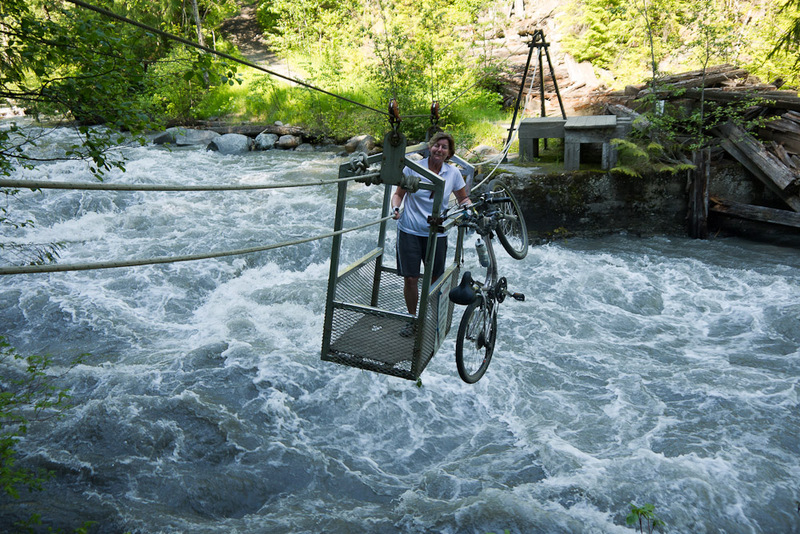 One needed to load the bike, unhook and pull yourself and the bike across the river, dangling just feet above the maelstrom. And it was so. Now for me, it was like being 10 again. For Nana it was like all of her kidney stones and childbirths rolled together with every scary movie she had ever seen. But she was brave. And she did the deed. Our version of Amazing Race. Mounted and ready to unhook. That is not joy on Nana’s face. But she is brave! Nana’s fear overcome. This because she is thinking how many pieces she needs to chop Papa into so that no one will find the evidence of the deed she contemplates. And so we completed our journey with no significant injuries. Though many were considered both accidental and purposeful. Nana is braver and Papa is wiser.